The Ca pump of the plasma membrane is an ATPase of the P-class (1–2), i.e. ; it forms a phosphorylated intermediate during the reaction cycle and is inhibited by low concentrations of vanadate (see 3–4 for comprehensive reviews). Calmodulin stimulates the ATPase by direct interaction, shifting the Ca affinity of the enzyme from the normal Km value, of between 10 and 20 μM to values around 0.5 μM. 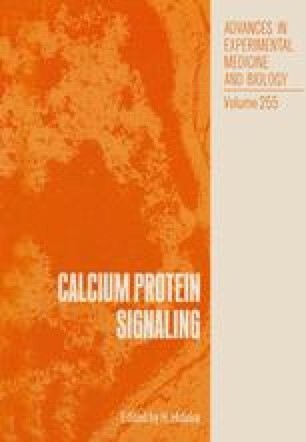 The direct interaction with calmodulin has been exploited to purify the enzyme to essential homogeneity on a calmodulin affinity chromatography column (5). The purified enzyme has been shown to be fully competent functionally: it has the expected high affinity for Ca in the presence of calmodulin, it is sensitive to vanadate, and can be reconstituted as an ATP-dependent Ca-transporting system in liposomes. Work on the purified enzyme has permitted to establish that its Ca/ATP-stoichiometry is 1, and that protons are obligatorily exchanged for Ca in the transport reaction. Table 1 offers a summary of the properties of the ATPase: A comprehensive review on the properties of the purified enzyme has appeared in 1982 (6). Most of the work on the pump has so far been carried out on erythrocytes, but the enzyme has been detected, with essentially the same properties, in all plasma membranes so far examined, with the possible exception of liver. One interesting property of the pump, first established on heart plasma membranes(7) but later extended to the enzyme purified from heart sarcolemma and from erythrocytes (8) is the activation by a phosphorylation reaction mediated by the cAMP-dependent protein kinase.